BIG & SPACIOUS - Ensign Peak's Shoulder Tote with Multiple Pockets and Zipper Closure is spacious and versatile. It is large enough to hold a laptop computer, books, lunch bag, umbrella, jacket and other items. You get the picture - it can hold a lot of stuff. It great for adventures - the bag keeps your items secure while traveling and easily fits beneath the seat or overhead bin. At the beach it holds towels, change of clothes, snacks, sunscreen and water bottles. It is also great for knitting supplies and crafts. 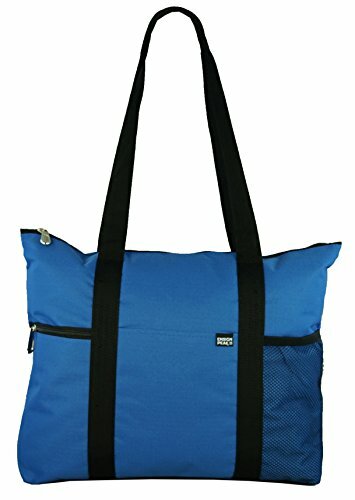 It makes a stylish but durable diaper bag. TOP ZIPPER & QUALITY MATERIALS - The full length top zipper keeps your items safe and secure, making sure nothing will fall out. The bag is made of super strong Polyester Ripstop fabric, which is surprisingly lightweight. The fabric has a water resistant lining making wiping up spills a breeze. LOTS OF POCKETS - On one side of the bag it has easily accessible zippered pocket to hold sunglasses, sunscreen, passports or other important items. A mesh pocket on the other side can fit a water bottle lotion or thermos. The main front open pocket is great for paper and other smaller items. INSIDE METAL KEY HOOK - The inside key hook keeps your keys out of the way, secure, and easy to reach. SIZE & MATERIALS - This bag is a spacious 20"W x 15"H x 5"D. There is a 6"W x 8.5"H front center pocket, a 5"W x 8.5"H side mesh pocket and a 5"W x 8.5"H side zipper pocket. The bag comes with 26" long 1.5"W straps, inside key hook and high quality metal zipper pulls. It is made from lightweight but durable High Quality 600 Denier Ripstop Polyester. BIG & SPACIOUS - Ensign Peak's Zipper Travel Tote is spacious and versatile. It is large enough to hold a laptop computer, books, lunch bag, umbrella, jacket and other items. You get the picture - it can hold a lot of stuff. It great for adventures - the bag keeps your items secure while traveling and easily fits beneath the seat or overhead bin. TOP ZIPPER & QUALITY MATERIALS- The full length top zipper keeps your items safe and secure, making sure nothing will fall out. The bag is made of super strong Polyester Ripstop fabric, which is surprisingly lightweight. The fabric has a water resistant lining making wiping up spills a breeze. If you have any questions about this product by Ensign Peak, contact us by completing and submitting the form below. If you are looking for a specif part number, please include it with your message.